In the multi-billion-dollar North American lumber industry, every detail in the process of getting the product to market, no matter how small, can have a significant impact on the bottom line. Clever, cost-reducing details are where Seaside comes in. We produce Poly and Paper Staple Cards. 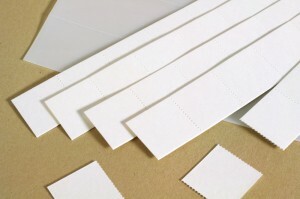 These small cards are inserted between the staple and the protective wrap around a lift of lumber, and prevent the wrap from tearing away from the staple. A small product that pays big dividends to our customers. 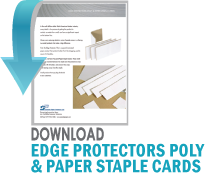 Our Edge Protectors for the Lumber Industry are custom made to work with strapping equipment. Wicket Boards/Wicket Wires – used together by plastic bag manufacturers to allow easy insertion of bags into automatic bagging equipment. Bread Tags – used by commercial bakeries to track baking batches. Roll Shims/Stickers – used by the rewinding industry to maintain even roll dimensions. Chicken & Fruit Pads – protect live poultry and fruit and vegetables during transport.